A jewel in the Mediterranean, Sardinia is a rustic and enchantingly beautiful island with extreme geography and vinous diversity to tempt travelers and wine enthusiasts alike. Mr. Sella and Mr. Mosca fell in love with this land over a century ago and established Sella & Mosca, one of Italy's most renowned wine estates. 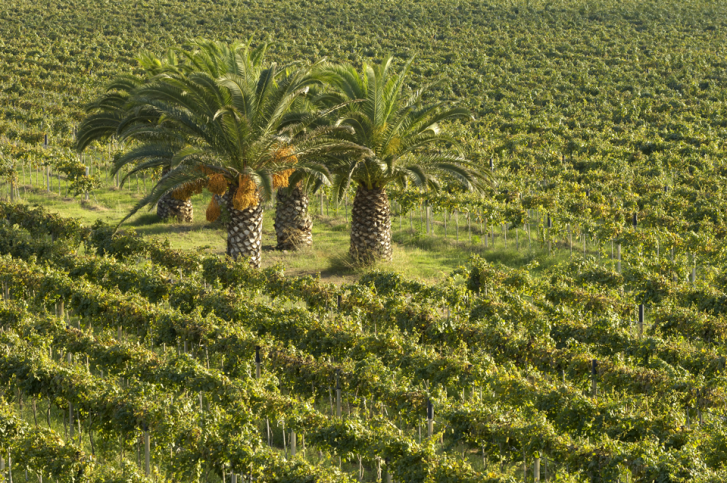 As Sardinia's foremost wine producer, Sella & Mosca’s premium wines are made exclusively from estate-grown grapes. In addition to native varieties such as Vermentino, Torbato and Cannonau, the winery has successfully pioneered the introduction of international grape varieties, notably Cabernet Sauvignon. In 1899, Mr. Sella (an engineer) and Mr. Mosca (a lawyer) from Piedmont, purchased the land bordering the pretty, historic port of Alghero on the northern coast, to establish a nursery for rootstocks. At the time, phylloxera was ravaging Europe, but as Sardinia is detached from the mainland, the island could harvest phylloxera-free baby vines, which were then sold in other regions of Italy and southern Europe. In 1903, a massive ecological excavation commenced on the purchased land where the Sella & Mosca estate now sits. The rocky soil was overturned to plant vines as well as to build a complex including: the winery, worker housing, a school house, a small church, and 12.5 acre nature preserve maintained for Mediterranean botanical species. The winery’s unique logo depicts a wine-pressing scene inspired by Egypt’s Old Kingdom. It is believed to be a stylized reproduction of a scene shown on a low relief in the mastaba of Mereruka tomb, Vizier of King Teti, in Saqqara, Egypt. The relief depicts five men using long poles to press the grapes contained in a sack, so that the juice filters through the fabric and falls into the jar below. Sella & Mosca’s 1,600-acre estate, I Piani, constitutes the second largest contiguous vineyard in Italy, covering more than 1,200 acres of vines. It is one of the largest wine estates in Europe. The climate is hot and dry. Inland vineyards cover mountainous terrain of granite, schist, sandstone and limestone soil. The estate is surrounded by landscaped gardens and a profusion of flowering oleanders, maritime pines, palm trees and eucalyptus. The winery features multiple tasting rooms, an expertly designed enoteca and a fascinating exhibit showcasing replicas of archaeological finds unearthed during the building of the estate. Every year, especially during the summer months, visitors come from all over the world to enjoy the wines and soak in the spectacular property. Winemaker, Giovanni Pinna, joined the estate in 2000. He holds a master’s degree in oenology and a PhD in microbiology. Passionate about Sardinian winemaking, Giovanni also teaching viticulture and publishes articles on the subject. Consultant winemaker, Giuseppe Caviola, is considered one of Italy’s most respected consultants, having traveled and worked throughout much of Italy. Giovanni and Giuseppe’s wines consistently garner critical acclaim and awards. The estate is owned by Terra Moretti Vino, an Italian company with strong ties in wine production, including the premium Franciacorta estate, Bellavista. The Moretti group continues to guide Sella & Mosca with the winery’s original founding principles of research, commitment, passion, and constant care.